Two Tip Tuesday – Happy New Year! My new tool, “Hex-a-ma-jig Jr.” has been ENJOYable. I love Hex-a-ma-jig and wanted the fun of that tool to translate to 2 1/2″ strips. Whether you have a “jelly” roll on hand to use or a bunch of strips or pieces or partial FQ you want to use up, “Junior” is the tool for you! A little side note on why “Junior”. – We don’t have any Juniors in my family but we have 4 generations of John Reece. I want to celebrate them! – My husbands son looks a lot like him. He isn’t a junior but sure could be in looks. – One of my favorite movie lines is when Sean Connery calls Harrison Ford “Junior” in “Indiana Jones the Last Crusade”. I have a HAPPY New Year giveaway. What do you have to do? Go to my website and print the FREE pattern for “Junior” Jelly Roll Quilt. The pattern is fast and fun! It is the “Two Halves Make A Whole” quilt from the “Hex-a-ma-jig Jr.” instruction booklet. 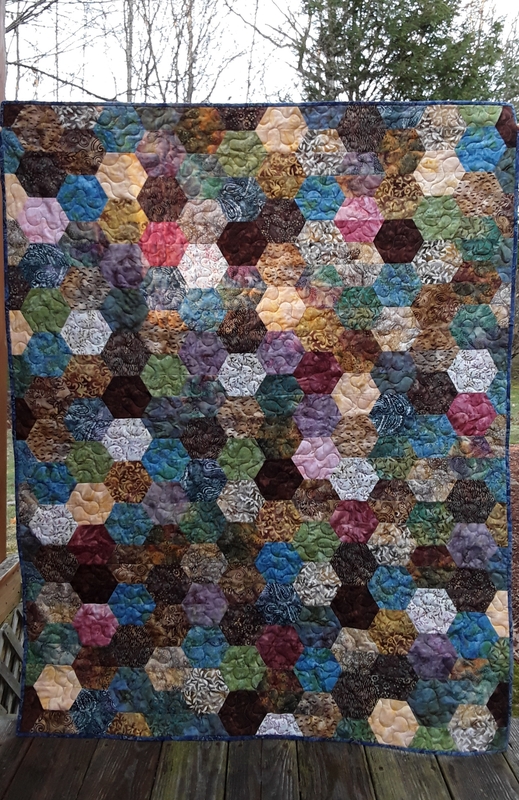 Using ONE “jelly” roll (40 – 2 1/2″ strips) you will can make a quilt! This uses “Hex-a-ma-jig Jr.”! Add quilting and a 1/2 yard for binding and Ta DONE! Finishes to 44″ x 56″ Enjoy! This entry was posted in Hexagons, Jelly Rolls, Uncategorized. Bookmark the permalink.